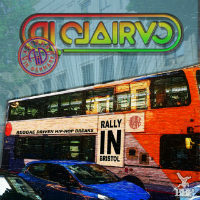 Continuing his long-running ‘Rally In…’ breakbeat series, DJ Clairvo is shortly to release Rally In Bristol featuring label-mates Aliens In Denmark. Anyone familiar with Clairvo’s work will know he’s a man with catholic tastes in breakbeat music and while this release follows in the slipstream of his rather splendid El Clarividente Latin breaks collection, the vibe is altogether more that of a pile-up between party breaks, bashment and hip-hop. 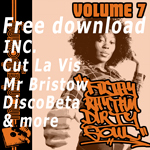 It is entirely appropriate then that one of the tracks should be called One For Stokes Croft – a piano n ragga vocals-toting skank that pays tribute to the epicentre of bass music, open-air cider drinking and general insurrection in the monkey’s home town of Bristol. Nor is it entirely unexpected to find the county of Somerset being honoured in the abrasive dancehall of Somerset Melodies – said county is, after all, the home of Portishead – a name forever to be associated with Bristol bass music (even if at many bpms slower than this track), not to mention the location of Shindig. What is surprising is to see Trooper’s Hill get a nod in Mirage Of Trooper’s Hill – another dubby breakbeat skank and surely the first to immortalise the Bristol suburb of Hanham’s distinctive chimney-topped rise. And what better way to open such a release than by commemorating An Evening With Tony – as synths and Dead Prez samples vie with thumping syncopated drums. Which, coincidentally, is how your head feels the next morning after downing god knows how many pints in Mama Renato’s and then attending an extremely loud breakbeat event.